The installation of a 12 cylinder engine into the BMW E32 was big news and actually caught Mercedes flat footed. What if you have thousands of dollars to burn making a V12 even faster? Today's feature is the answer of that exact question along with a substantial list of other modifications that are not normally associated with the luxury 7 series car. The six speed manual conversion is just the cherry on top of this sundae. 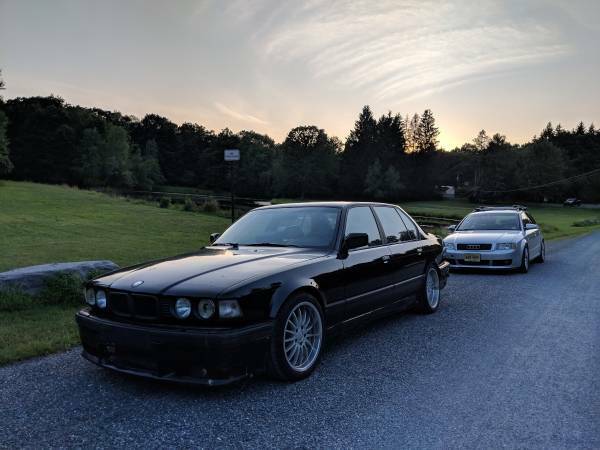 Find this 1991 BMW 750il for sale in Alpine, NJ for $6,500 via craigslist. Up for sale is a 1988 BMW 750iL (E32) with the 6-speed manual out of an 850CSi and a Vortech V2 supercharger. I picked it up a few weeks ago with the intention of making it a project car, but plans have changed and I don't have the time I'd like to dedicate to it anymore. This car is truly one of a kind. The owner who had all the work done purchased it for $50k in 1990, then proceeded to put another $50k into modifications until he sold it in 2012. The Vortech V2 supercharger and HKS blow-off valve, along with the custom exhaust, make for the absolute most insane-sounding car I've ever heard. The 6-speed swap was professionally done by Schneller BMW in Massachusetts, with the donor transmission taken from a 1995 850CSi. 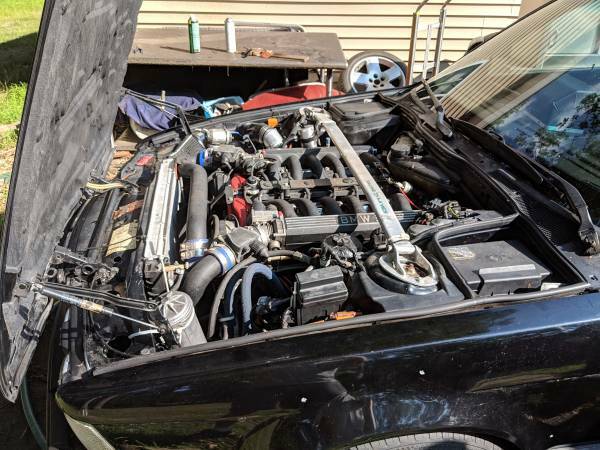 Other details include a 3.15 LSD (stock), custom chips, upgraded 24lb injectors, an intercooler, a Racing Dynamics strut bar, the Dinan E32 suspension package, and big Brembo 4-piston brakes. The car was dynoed at 400whp and clocked at 0-60 in 5 seconds flat. It also has a custom-made E36 M3-inspired bodykit, and it's currently sitting on Breyton Magic wheels with new tires. However, it needs a bit of work right now. The clutch has completely gone, so the car is not drivable even though it starts up and runs. There's also some paintwork that needs to be done, primarily on the roof. The car itself has no rust, but the custom rear bumper has some surface rust (I'd personally just replace it). The head unit is missing, but you can easily pop any single-DIN in. I'm asking $6500, with trades considered. I'm negotiable, but please don't lowball me; you could part this car out and still be in the clear. 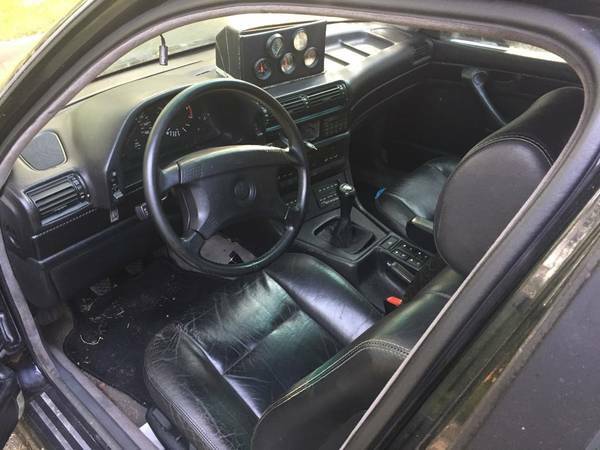 The 850CSi 6-speed transmission is extremely hard to find and is worth $4000 alone. I also have over $500 in UUC parts (EVO 3 short shifter, shift knob, e-brake handle) for the car that will be included. If it doesn't sell, I'm perfectly happy to keep it and fix it up over time - it is literally one of one. John Cusack's character in Say Anything could have used the black dash mounted boom box in the movie. Would you just look at that damn thing!!!! If it were my car, I would lose the gauge filled boom box, swap on stock bumpers, fix the clutch, and drive the living hell out of this thing. I'm calling Collusionon! Bullsh*t this is Alpine, NJ! This is definitely located in Mother Russia! What an outrageous build. Fantastic if you were smart and crazy enough to work on it. Not going to mention the foamcore and hot glue box on the dash. NJ does not need to fabricate this sort of bad publicity. You are not alone, there is something fishy about this. If I bought it I would convert the dash box to be an aquarium so I could take my pet fish on the craziest ride if it's life. Is the clutch the only thing that is toast? Maybe the transmission is done also. No way to tell without a working clutch unless you pull it.